An Obama fist bump with Vũ Nhật Tân at Bún Chả Hương Liên. 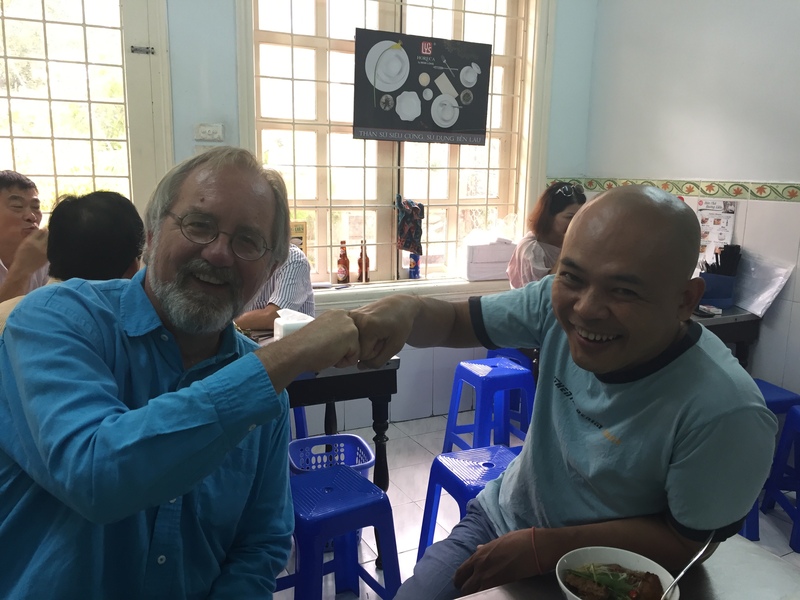 We decided that an early brunch idea was best, were met at our hotel by Tân and Hà Nội New Music Ensemble manager Bông Hoa and all took a quick taxi ride through the fascinating French Quarter of Hà Nội. We’ll be going to other bún chả places because the Old Quarter was off limits for Obama’s visit with Anthony Bourdain, for security reasons. So the default decision was the more accessible French Quarter. Stay connected! The inner sanctum of Bún Chả Hương Liên at 24 Lê Văn Hưu in the French Quarter. Notice the photo of POTUS and Bourdain to the left. 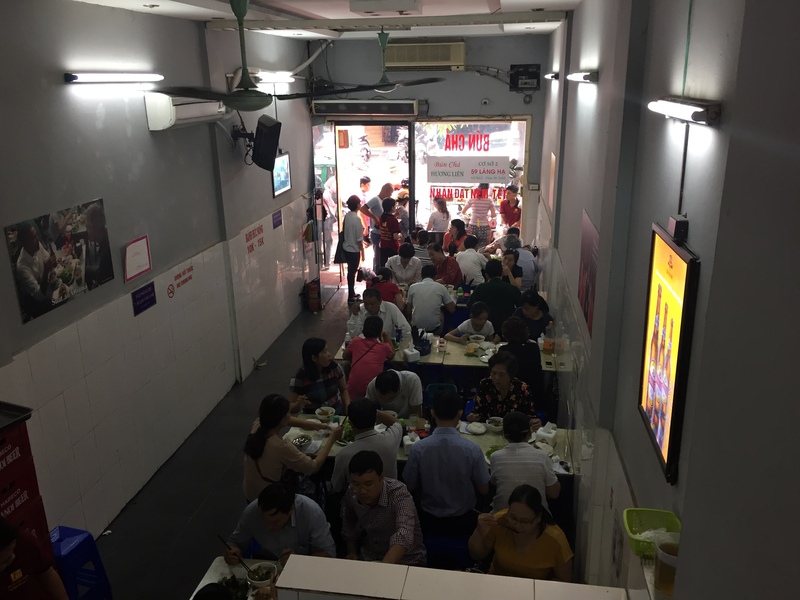 But trust us, Bún Chả Hương Liên is now best described by a Yogi Berraism that “they are so successful nobody goes there anymore.” Expect a long line or follow Vũ Nhật Tân’s beat the rush strategy, as the combination of Obama and Bourdain have made the place a destination meal even before the CNN episode airs September 25. Bún Chả Hương Liên deserves the recognition, as do hundreds of other similar shops in Hà Nội. Decisions are always challenging, and I feel for anyone who makes them. No matter what appearances exist, one is rarely automonous in this world. 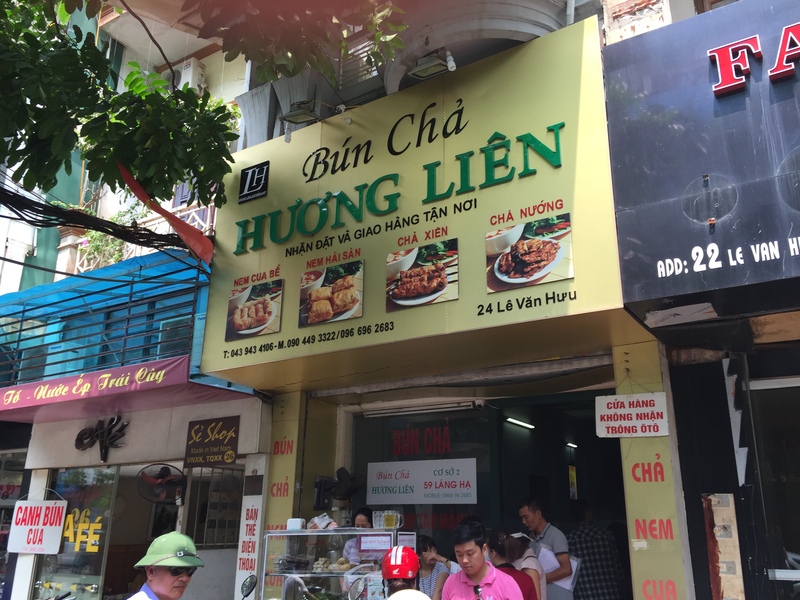 I’ll find out about other bún chả places in Hà Nội that deserve recognition. Like Paris, which is always in the shadows in Việt Nam, eating in this town does not fit into an hour TV show! A photo of President Obama greeting the owner is proudly displayed. Bún chả is a dish unique to Hà Nội. It consists of fresh noodles that are added with chopsticks to a sauce broth, which was, truth be known, somewhat on the sweet side for my Vietnamese friends in the version we had at Hương Liên. The sauce broth (bún chả reconciles soup and sauce) has a lot of vegetables in the bottom and all serve to float grilled pork and pork patties. You of course add a myriad amount of fresh Vietnamese green herbs like rau răm, basil and mint. Finally, and it’s up to you, you counteract the sweetness with fiery red bird chills and the deliciously pungent garlic unique to Việt Nam. Wash it all down with a cold beer, included in the Obama Combo. Notice the red bird chilies, green herbs and yellow garlic. Color symbolism intentional. To the right of the sauce bowl are Obama Combo fried crab rolls. The essential fresh noodles are only partially visible in the upper left. Ordering was easy. 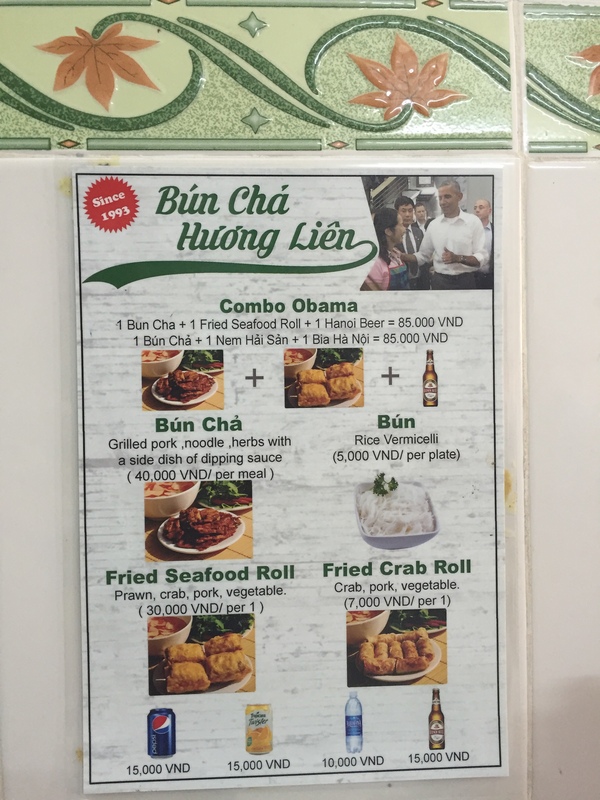 We had the Obama Combo, which includes bún chả, fried crab rolls and a beer. 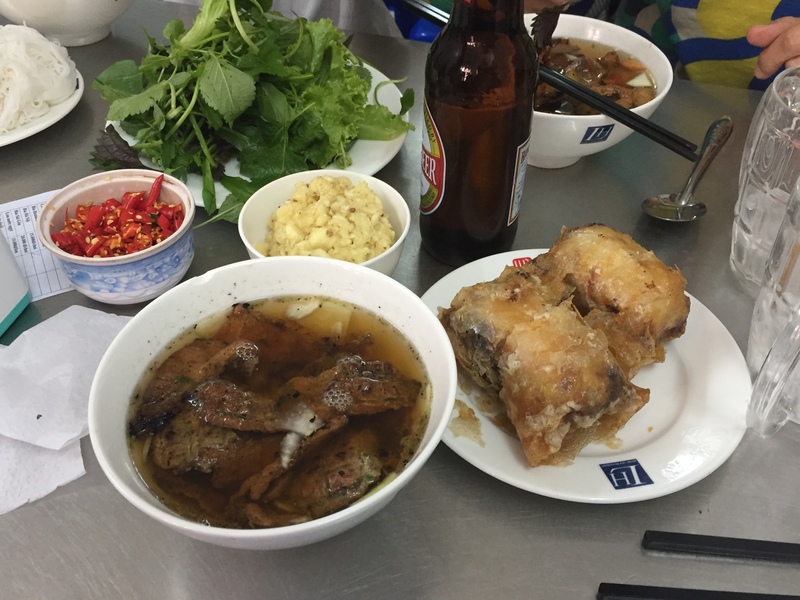 Order one for yourself next time you’re in Hà Nội. POTUS gives a thumbs up to Hương Liện. Go to full screen for all the details of the Obama Combo. One of the delights of Vietnamese cuisine is the enthusiasm of the Vietnamese when they explain the best way to create your dish. Fold it this way, not that way. Let me help you. Dip in only that sauce. Of course, add the amount of herbs and chilies and garlic you like. You can ask for more broth. Do you like our food? If you’re the oldest, start eating, as younger people will never get their meal if you think Western politeness means they should go first being your host. They won’t. They can’t, as I now fully understand beginning to formulate sentences in Vietnamese. 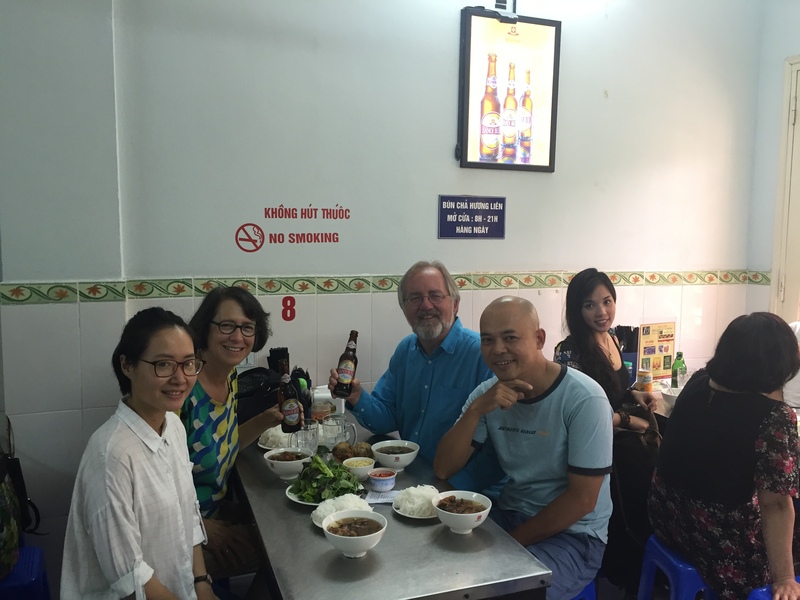 No blog is long enough for that topic…..back to bún chả! A smiling Bông Hoa shows us the right bún chả etiquette. 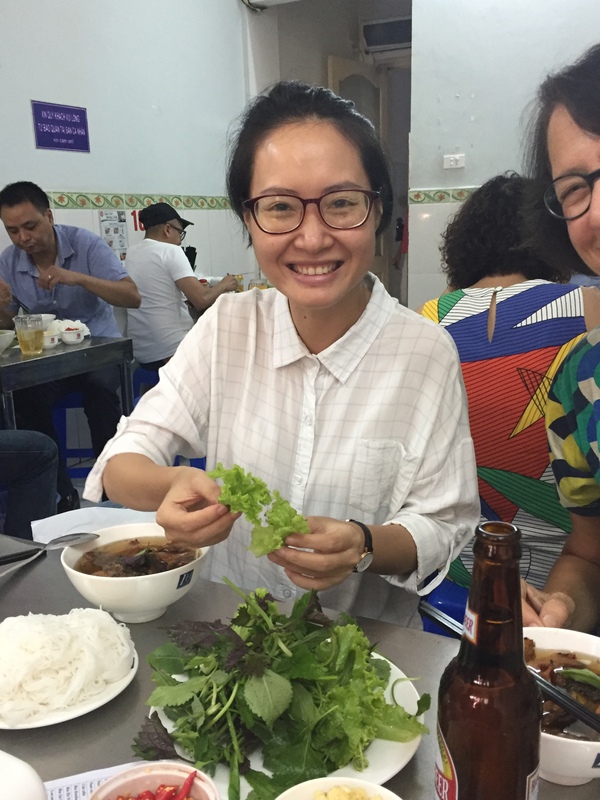 Bông Hoa and Jan with the fresh white noodles. 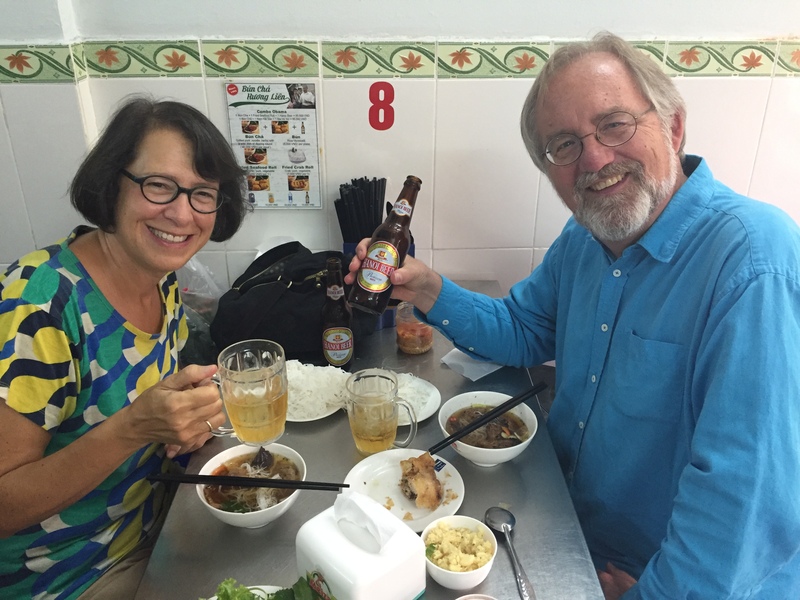 Jan and I enjoying the Obama Combo with a cold Hà Nội beer. Jan and I are indeed coming from somewhere, celebrating with Vũ Nhật Tân and the Obama Combo. 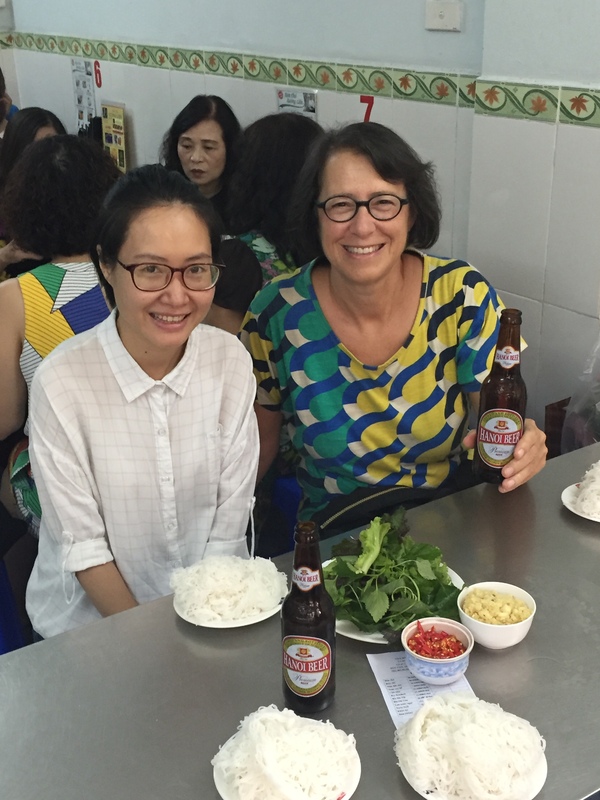 Our bún chả meal was not an abstract chance to have another beer, visit yet another of Hà Nội’s dizzyingly delicious mom and pop places, nor a plug for Obama on CNN. This was a special moment for us as Americans and Vietnamese. Jan and I do know a good deal about the Asia pivot of the Obama foreign policy, as we spent two years directing the largest cultural exchange in history between Việt Nam and the United States under Hillary Clinton’s State Department. Countless phone calls, emails, and meetings in Washington at the State Department and with the U.S. Embassy in Hà Nội. Because of our State Department work, and like many other people, we briefly met the President’s luminous wife, Michelle. Senior White House Advisor Valerie Jarrett spoke with us in Pasadena in 2009 about the goals of the President’s reset with Southeast Asia, as his father worked in Myanmar and he grew up in Indonesia and speaks fluent Malay. These are deep waters. Tân, Jan and I were celebrating that we know how to handle the waves over the twelve years we’ve been coming to Việt Nam and he has been coming to the United States, and we were happy to welcome Bông Hoa to the story. 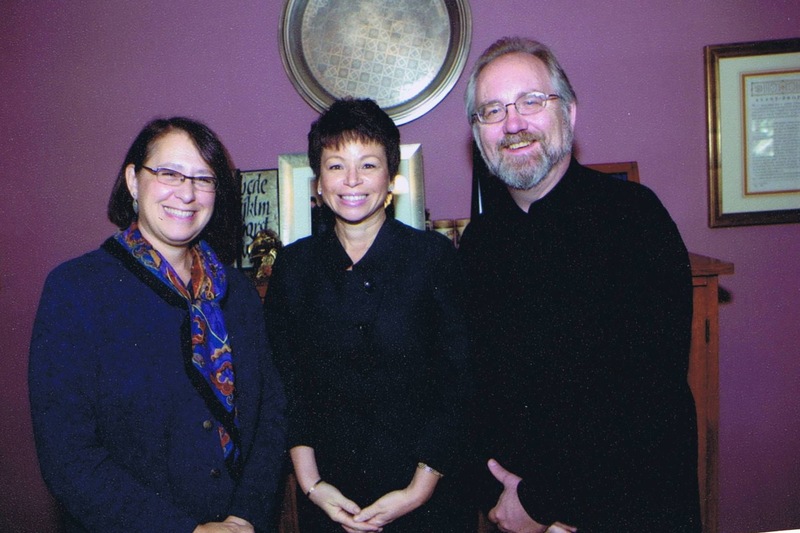 Discussing our work in Việt Nam with White House Senior Advisor Valerie Jarrett in Pasadena, October 2009. 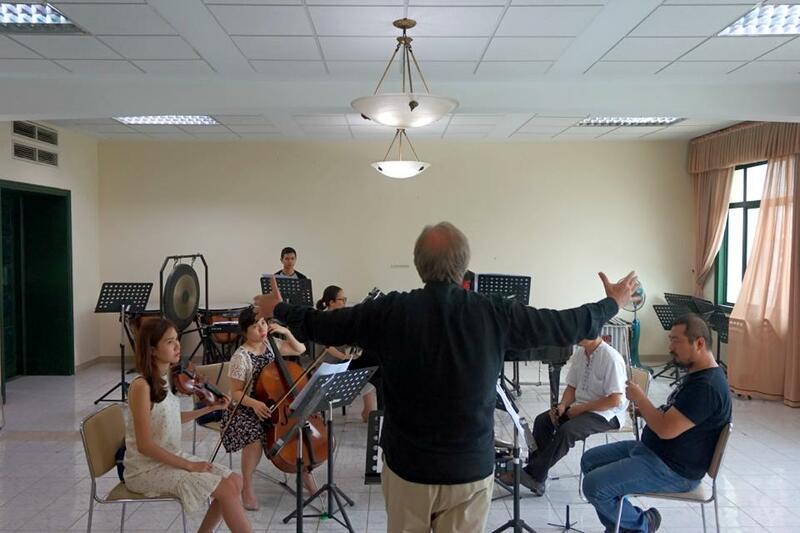 When Vũ Nhật Tân successfully advocated for our appointments in August 2015 to become the first American arts advisors approved by the Vietnamese government, our role was to guide the creation of the Hà Nội New Music Ensemble. Our side of the equation, that is the foreign policy wonks of the U.S. Government, now saw a willingness for next steps between the United States and Việt Nam after a major State Department investment in resources. And on cue Ambassador Osius and the U.S. Embassy rolled out its red carpet to emphasize the importance of cultural diplomacy and long term cooperation between our countries because of our new advisory status. The reality of next steps for the Hà Nội New Music Ensemble were confirmed by the U.S. Embassy last October. Culture neither survives nor advances by accident. 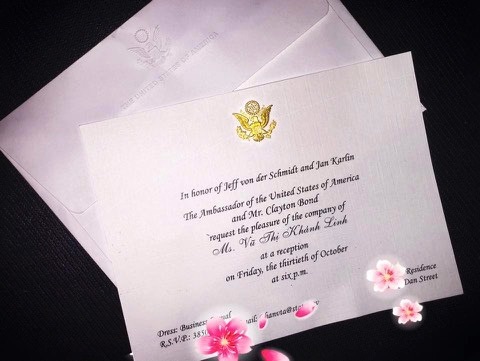 Because of twelve years of patient work, our Embassy included Vũ Nhật Tân in its invitation so he could hear President Obama speak in Hà Nội. Talk about making a lasting impression. This stuff just doesn’t fall fully formed from the sky. 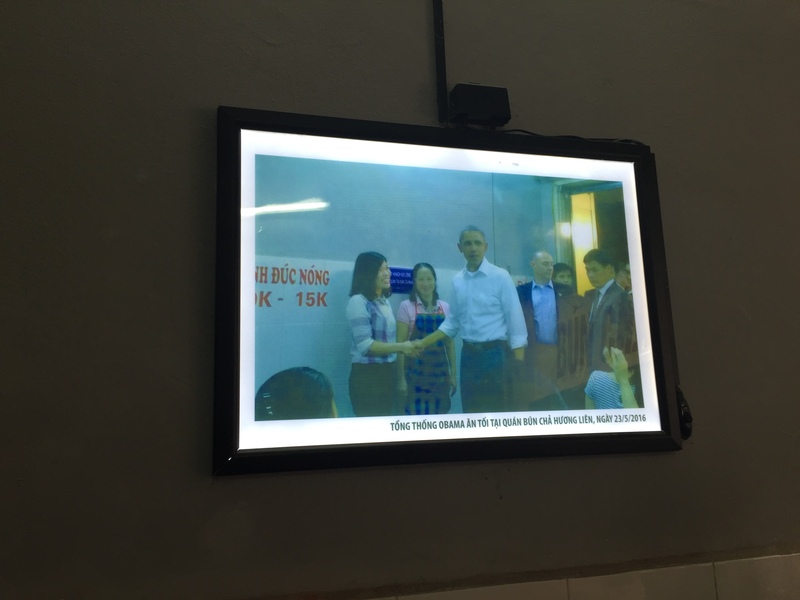 And like the late September autumn winds breezing gently in Việt Nam, it was with a lot of fresh joy that we celebrated together with the Obama Combo at Bún Chả Hương Liên. Celebrating a continuous journey in new music between the United States and Việt Nam with the Obama Combo! After the Obama Combo, I can’t wait to get back to work focusing on every note, rhythm and dynamic, every detail, for all the upcoming Hà Nội New Music Ensemble rehearsals and concerts this autumn of Vũ Nhật Tân, Claude Debussy, Trần Kim Ngọc, Olivier Messiaen, Nguyễn Thiên Đạo, Pierre Boulez, Nhật Mính Nguyễn, Igor Stravinsky and Tốn Thất Tiết. The new reality is that Americans and Vietnamese are making music together. The 21st century in Southeast Asia is a lot better than the last one. Thanks, Obama! With my good friends in the Hà Nội New Music Ensemble.